Sweeney Chevrolet Buick GMC - Page 8 of 9 - Automotive News, Local News and Much more! Danica Patrick dominated the track with her new Chevrolet SS. Team Chevy racing kicked off Speedweek with an outstanding performance, not only from the drivers but also from the all-new Chevrolet SS race car. 7 out of the top 9 starters at the Daytona 500 will be driving the Chevy SS! One of the drivers, Danica Patrick made history behind the wheel of her godaddy.com SS. She is the first female to win the pole for the 55th running of The Great American Race. They also mark the first time in the 64-year history of the NASCAR Sprint Cup Series that a woman will lead the field to start ANY race. With a lap time of 45.817 seconds and a speed of 196.434 mph, she lead the pack of 45 qualifiers. The new Chevrolet SS production car will pace the dayton 500, leading an all-Chevrolet front row to the green flag. You will be able to purchase the new performance sedan later this year. When it arrives in showrooms, the SS will the ranks of the Corvette and Camaro in making Chevrolet America’s favorite performance sedan for the past two years. For more information about the SS or any of Chevrolet’s other performance cars, give us a call at 330-SWEENEY or email us at [email protected] We can’t wait until the SS hits our showrooms! The new 2014 Chevrolet Performance Sedan is not only dominating the race track, but it is also set to dominate the showrooms! Have you ever felt uneasy giving your keys to a valet? If so, you’ll especially appreciate a new feature on the 2014 Chevrolet Impala! The redesigned Chevrolet Flagship Sedan (which will be available at our Youngstown, Ohio dealerships in about a month) will feature “Valet Mode”. Valet mode shields your personal items and information from prying eyes and sticky fingers! The Impala’s new center stack features an 8-inch color touch screen radio that will double as a PIN-activated retractable face plate over a secure storage bin. The storage behind the touch screen is large enough to hold valuables like your iPod, wallet, smartphone, etc. One of the features of the new Impala is Chevrolet’s MyLink system which, when synced with your smartphone will hold all of your contacts and make them accessible through voice commands. However, when you activate Valet Mode all of this information, as well as your on-board navigation are inaccessible! You’ll be able to access Valet Mode through MyLink’s settings menu via a four-digit code, much like a safe. A confirmation entry of the code locks the bin and secures all of your info! Everyone knows that Sweeney Chevrolet Buick GMC is the Mahoning Valley’s Lease Return Headquarters! We specialize in getting you out of your lease early, no matter what make or model it is. Now, for the next 8 days, if you have a current GM Lease, we can not only get you out early but we can also give you up to $2,000 on the next car you choose to buy or lease! This is in addition to rebates and incentives already going on! Did we mention that this extends to leases that are set to expire between now and 12/31/2013? Did you know that Sweeney also offers a free lease turn in inspection? We’ll have an expert inspect your car and let you know if there’s anything you need to get fixed before you turn your lease in! This will prevent any surprises and unexpected charges when you do turn in in. At Sweeney Chevrolet Buick GMC in Youngstown, Ohio our goal is to provide a buying experience different from any other. We strive to completely satisfy each and every customer that walks through the doors of our dealerships. When we get reviews like this from our customers we know that we’ve met those goals. If you have something you’d like us to know about a recent visit, email [email protected]! I was considering doing business with Taylor Kia, Columbiana Cadillac, or Sweeney GMC. I liked the styling of the Terrain but the difference maker was my salesman, John Cefalde. This was the second car I have purchased from John. He always responds promptly to my questions and I trust him. Thanks for such a great review, Mike! Sales And Leasing Consultant John Cefalde at Sweeney Chevrolet Buick GMC in Youngstown, Ohio. The Rumors Are True! There Is A Diesel Version Of The Cruze Coming! By now, if you follow the auto industry, you’ve undoubtedly heard that the 2014 Chevrolet Cruze will be available in diesel! The National Biodiesel Board had some very kind things to say during their review of the 2013 Chevrolet Cruze Light Duty Diesel Passenger Car! The vehicle was recently approved for use with 20% biodiesel blends (B20). The new Chevrolet Cruze Clean Turbo Diesel features a 2.0L disel engine that will offer an estimated 42 mpg highway and an expected best-in-segment range based on GM testing. Using modern diesel exhaust technology and ultra-low sulfur fuel the Cruze will be 90% cleaner than other makes, and will be General Motor’s cleanest passenger car ever produced. The Cruze’s engine is based on the proven architecture already used in Europe where GM is already selling close to 40% of all Cruze models with a diesel engine. Chevrolet’s US Engineers worked with German and Italian engineering groups to adapt a version of the engine for use in the United States where diesel emissions standards are much higher and where there are a wider range of driving conditions. So why is this important? General Motors is committed to reducing their carbon footprint and made a pledge they would do so over the next several years. This is a MAJOR step for a company that has already delivered on this pledge time and time again. Biodiesel is an advanced biofuel made from sustainable resources such as soybean oil, used cooking oil, and other lipid sources. It’s the first and only EPA approved advanced biofuel produced on a commercial scale across the United States. 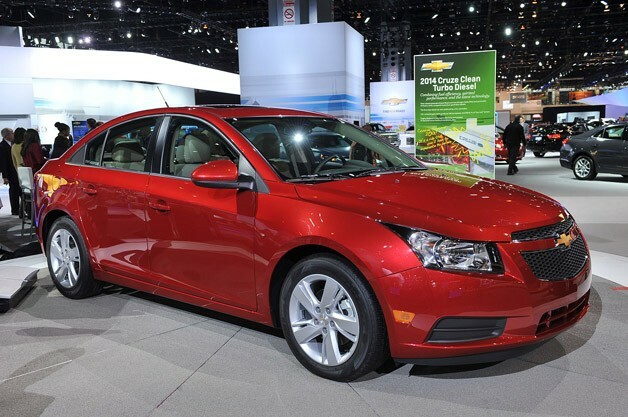 The 2014 Chevrolet Cruze will be available in Diesel! The Chevrolet Sonic and Spark are the first cars that will feature hands and eye free use and integration! The 2013 Chevrolet Sonic and Spark will be the first vehicles ever to be available with Apple’s Genius Software Siri! Siri, an intelligent assistant that helps you get things done just by asking it! The Sonic and Spark are the first vehicles to offer the software completely eyes and hands free. Through the cars’ standard Chevrolet MyLink, customers with a compatible iPhone (iOS6) can direct Siri to perform a number of tasks while thye safely keep their eyes on the road and their hands on the wheel. You will be able to interact with Siri with nothing more than your voice. There’ll be no need to take your hands off the wheel, or your eyes off the road. Make voice-activated, hands-free calls to contacts in their iPhone. Play songs from their iTunes libraries. Listen to, and compose and send iMessages or text messages to anyone in your saved contacts or a phone number you have memorized. Access your calender and add appointments. Minimize distraction even more by keeping the screen of your iPhone from lighting up, even when Siri answers your questions. To learn more about the 2013 Chevrolet Sonic or Spark, email us at [email protected] or visit www.sweeneychevrolet.com! Using Siri is now as easy as literally hitting a button on your Chevrolet’s steering wheel! It’s no secret that GMC pickups are built to last and that GMC stands behind them…GMC already features the best warranty’s in the industry and to show that GMC means business, they’ve recently announced a major enhancement to any lease on a 2013 Sierra 1500. In addition to the standard five-year/100,000 mile powertrain warranty and three-year/36,000-mile bumper to bumper warranty GMC is now offering FREE scheduled maintenance costs for your two year lease (this includes free oil changes, free oil filter replacements, free tire rotations and free multi-point vehicle inspections). That means that you literally have nothing to worry about the entire time you’re leasing your Sierra! This warranty and lease coverage also extends to purchases as well. Did we mention that this is absolutely free? This is included in the price of your lease or purchase! The Industry’s best pickup…The industry’s best coverage. Our 2013 Corvette we are selling at a heavy discount! How often do you see semi trucks along side the road when you’re driving down the road? Primarily this enables the truck drivers to use their cabins technologies like TV, internet, climate control, etc. while they’re taking their mandatory rest times, or just need a break. In addition to all of the carbon monoxide released into the, it costs truck drivers and their companies a very large sum of money to keep these trucks running. It’s for these reasons that Chevrolet is supporting the IdleAir Project, which enables truck drivers to use all of these technologies without having to idle their engines. With Chevrolet’s help IdleAIr can further expand the availability of its engine-idling alternative. Drivers who use IdleAIr pull into designated spaces, hook up a window adapter that then accepts a unit from a heating and cooling air vent, TV, power outlets, internet and other conveniences. The truck engine can then be turned off. Drivers who use IdleAir save 1 gallon of diesel fuel per truck, per hour. Some stations are evening solar powered, further reducing energy used. Chevrolet collaborated with The Nature Conservancy to assist in managing about 20,000 acres of forest to improve ecosystem habitats. In a partnership with Gualala River to help them avoid commercial timber harvesting and allow existing trees to continue to grow. Chevrolet supported Dempsey Ridge wind farm in Oklahoma by investing in 66 wind turbines on 7,500 acres that produce 132MW and doubles as a grazing land for livestock. The Dempsey Ridge Wind Farm in Oklahoma. The land also doubles as grazing land for livestock.